It was his first visit to a Gulf country, and one made with the great hope that he could earn a little bit and provide a better living for his family. Mohammed Bilal, a 42-year Bangladeshi plumber, came to Oman in December 2017 to work for a small-time builder with big dreams. Mohammed paid around USD3500 to secure his job in Oman, cover recruitment charges and visa fees. He pledged his land and his wife’s jewelry back in Chittagong, Bangladesh. But just three months after his arrival, he suffered a mild heart attack and was admitted to a private hospital. As he did not have any health insurance he had to foot the medical bills from his own earnings. Though Bilal was unable to pay the entire fee, the hospital discounted his bill and discharged him. Two months later, he had a more severe attack. He was again admitted to the hospital, receiving timely and critical treatment. Though he was soon declared fit to leave the hospital, he couldn’t because the roughly USD6,500 bills were too high. He was forced to be an inpatient for three months. Food was provided by hospital staff. The employer did not provide any support. though he continued to hold onto Bilal's passport. Fortunately, an Indian cultural group came across his case and helped him. They brought his case to the attention of the Bangladeshi embassy, talked to the employer, and raised money to buy him a ticket. Bilal finally flew back to Bangladesh in April 2018. Bilal’s case is not an isolated one in Oman. There are hundreds of Bilals as health insurance coverage for migrant workers is not mandatory, while medical costs are exorbitant. Even though some companies provide health coverage for their workers, the majority of smaller companies do not. And eventually, the workers are left in the lurch when they fall ill or meet with an accident. Shameer PTK is a member of an Indian cultural organisation, who, along with his friends, helped Bilal. He has seen firsthand how the lack of health insurance cover adversely impacts workers. On July 15, the Capital Market Authority (CMA) in Oman tagged the Ministry of Manpower and tweeted that a draft plan is being formed to provide health insurance for migrant workers in the private sector. “Only a few good companies provide health cover for migrant workers. Majority of the small companies do not. So, what happens is that when a migrant worker who doesn’t have health insurance cover falls ill or meets with an accident, it is quite difficult to get proper treatment. 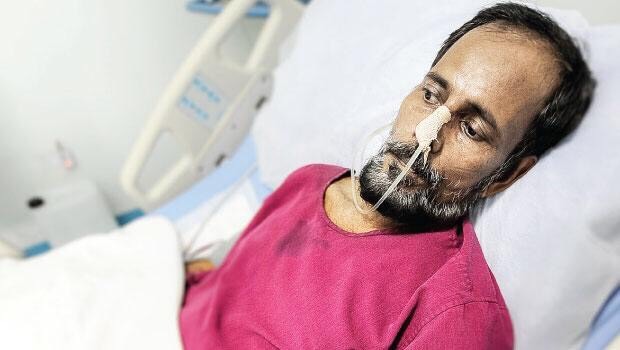 Most of the time, the medical bills are cleared by social organisations,” Shameer, who welcomed the move by CMA, said. In a week, he deals with at least half a dozen workers in need of medical care that they cannot afford. “The bills are quite high in Oman, so it is really a problem for cultural organisations who take up the case,” Shameer added. He also noted that none of the embassies in Oman has a fund to foot medical bills for their citizens. Confirming the move to Migrant-Rights.Org, a senior official at Oman’s Ministry of Manpower said that the plan will be adopted very soon and an official announcement will be made. “Companies will be paying the premium for workers. Technicalities are under discussion,” said Sulaiman Khalili, Assistant Director at the Information Department at the Ministry of Manpower. Md Nazmul Haque suffered a cardiac arrest in 2014. He was a blue-collar worker without insurance and employed by a small-time builder who couldn't afford to pay his medical bill. Social workers in Oman and charity groups in Dhaka raised money to clear his OMR 2000 medical bills and repatriate him to Bangladesh. Meanwhile, an insurance company executive said that there are currently group medical insurance schemes available in Oman for workers, but individual medical insurance is unaffordable and not common amongst blue-collar workers. Philip K Philip, Group CEO at Muscat Insurance Company in Oman, said that Omani companies had not provided medical insurance for their employees until about three years ago. He added that in the meantime, contracting companies and the like take Workmen Compensation cover which takes care of employers’ liability in the case of accidental death, debilitating injuries and related medical expenses while the employee is in harness. This does not cover other illness or medical conditions. When asked who will benefit from the mandatory health cover schemes, Philip said that health service providers will benefit (most) from the proposed system. “When I go to a clinic for normal cold or flu as a cash customer, the General Physician does the medical examination and prescribe the bare minimum medicines and tests. In the same situation, if someone is approaching the same clinic with an insurance card, the tests, lab, prescriptions etc would be far different from the original case. It is not uncommon in several markets [to find] doctors working on incentives rather than fixed salary,” he added. “If the system is not abused or misused, it certainly would benefit the employer, employee and all other stakeholders. No doubt, the workers will benefit from the compulsory medical insurance,” Philip added. Meanwhile, the Oman Contractors Association executive told Migrants-Rights.org that in the present economic condition, providing health insurance coverage for migrant workers would be an extra burden on the companies. “Having said that, the requirement is needed to protect the workforce against health and work injuries and I am sure that health insurance coverage will be a blessing for workers in general,” said Shahswar Al Balushi, head of the government's Tanfeedh labour lab programme and CEO of the Oman Society of Contractors.